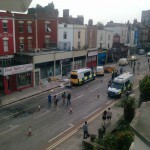 Questions are being asked as to why a peaceful protest descended into violence on Thursday night in Stokes Croft. From around 9pm onwards crowds had gathered for a previously-cancelled protest against alleged police brutality during the riots a week earlier before violence broke out at around 1am. 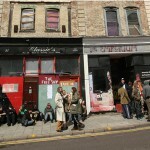 Protesters stood outside the Telepathic Heights squat – the scene of a police raid which sparked last week’s violence – playing music while several police vans waited cautiously nearby. 28/04/2011 – A few individuals gathered yesterday at the Chilean Embassy in central London as a small token of solidarity to the Anarchist comrades in Chile (on their 65th day of hunger strike). A banner was opened that read FREEDOM TO THE ANARCHIST COMRADES IN CHILE, ACCUSED IN THE “CASO BOMBAS” ON HUNGER STRIKE SINCE 21/2/11-. Some went into the embassy and threw flyers into most offices and entrance area while screaming IMMEDIATE FREEDOM TO THE CHILEAN ANARCHISTS ACCUSED IN THE CASO BOMBAS CASE!. Fliers were also given to passersby and workers in hard hats on the scaffolding of a building opposite, who broke into a shout of FREEDOM! with fists raised (for them it was a bit of a joke) along with the comrades. Metropolitan police have raided several squatted autonomous centres in London, in a media-spectacle in which the pigs promise more raids. The raids are apparently in connection with the 26 March demo and the pathetic Royal wedding this weekend. April 21, 2011. 10pm. 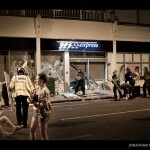 A riot starts after a 160 strong multi-regional police force coordinated assault shuts down a district and breaks down the door of a squat named ‘Telepathic Heights’ in Bristol. The cops then violently harass local people and get attacked in return. Telepathic Heights is in the busy cultural area of Stokes Croft, Bristol, where there are many bars, cafes, squats, community projects, etc. 300 people fight the police for hours and hours in response to the police occupation of the neighbourhood. A corporate supermarket is looted and destroyed, whilst none of the other (independently-owned) shops on the streets are touched in the disturbance. FOR THE ACCESS TO LAND! AGAINST THE AIRPORT AND THE WORLD IT REPRESENTS! Possession has been granted to Jerwood Trading Ltd from the 5th of May 2011. This means that bailiffs can arrive with the lawyers of Jerwood at any time from that date. They plan to auction off the buildings through the auctioneers Maggs and Allen.